Did you have a favourite? Please let me know. I am often scouting the trees for birds so sometimes I get unusual aspects of birds. It may be Winter, but here, it is the time when birds drop in on their way north to build their strength for the next part of their journey, or stay for the winter in the warm days on the North Coast. The nights can get cold but the days are usually in the low 20’s C with the warmth of sunshine and the number of plants that flower in late Autumn and Winter makes it a good place to stop off. This is not a complete record of birds as there have been birds who I haven’t managed to get in my lens plus there has been some who have just been to fast for me to photograph. Yes I have quite a number of photos of empty branches!!! This first gallery of photos are the birds from my place. The White-throated Honeyeaters arrive in the morning and in the afternoon with their chirp chirp chirp as they set about diving into the birdbath or pool to have their bath. The Yellow-faced Honeyeaters arrive from down south, some stay while others in the flock fly further north. The Blue-faced Honeyeaters come and go all year depending on what food is available. The Honey Gem Grevillea has finally started to flower after a long dry hot Summer. Look at the pollen dust on his head. The little Eastern Spinebills are here with the distinctive clicking of their wings as they zip around the garden and their calls echoing in the gullies. You can judge their size by comparing with the Blue-faced Honeyeater and Grevillea flower above. They really stretch to reach the blossoms at times. Their plumage is quite pretty don’t you think? I don’t include many photos of the female Golden Whistler but this one is so cute. They are around the place all year round with their repetitive call which can sound like a squeaky wheel, at times up to twenty single notes. They also like to land on the side of trees and have a look around. As do the White-throated Treecreepers who just hop up and down the trees looking for insects under the bark. They have a similar call to the Yellow Robins but not as persistent. They also like to defy gravity as the give the trees a very thorough checking over. The tiny Red-backed Fairy Wrens like to explore the lower parts of the forest eating grass seeds and insects foraging among the grass stalks. The Jenny Wren has good camouflage. The Silvereyes are migrants who stop for a few weeks to gather their strength for their next leg of their journey north. They are another of the tiny birds around here. The Red-browed Firetails are another constant visitor to the bush as they move about in small flocks looking for grass seeds. This is a young one as the red brow isn’t as prominent as the adults. The tiny Striated Thornbills are always around the garden and in the gullies around the house. Someone who I haven’t seen for quite a while has turned up this month and has been around the garden early in the morning and in the gullies during the day. The Spotted Pardalote digs a tunnel in the side of the gully to make it’s nest. They are so pretty aren’t they? I think this one saw me as I snuck along the verandah for a better photo. They can be quite vocal too. The sounds of Kookaburras signal the start and end of every day. There are about three families that live in the bush around the house and sometimes the cacophony of up to five or six Kookaburras can be quite deafening. After I took this photo I noticed that there was another two sitting nearby in separate trees. All of a sudden they all flew off into the forest disappearing among the trees. This next gallery are from my besties place. The Lewins Honeyeater is the boss of my besties garden. They swoop on most other birds that dares to come into the garden. The Lewins at my place aren’t as bossy. Can you spot the Varied Triller? 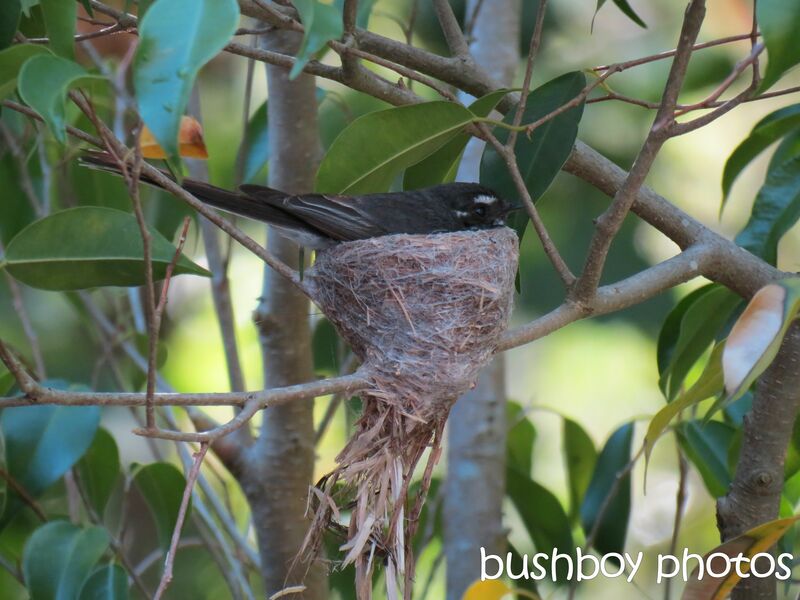 The Grey Fantails are always doing their acrobatic flying around the place catching insects on the wing. A very serious looking bird. The Golden Whistler is always around the garden and nearby rainforest singing its lovely song. My besties place is surrounded by rainforest so she has more doves and pigeons than I do at my place. The White-headed Pigeon has a deep sounding whoomp whoomp call. They also fly about in large flocks. The Brown Pigeon didn’t want its photo taken. There is always up to ten bar-shouldered Doves foraging on the ground in the garden looking for pecans that have fallen from the tree. The Whipbirds also enjoy foraging among the leaves for pecans. While high in the trees the Figbirds look for seeds as well as pecans. 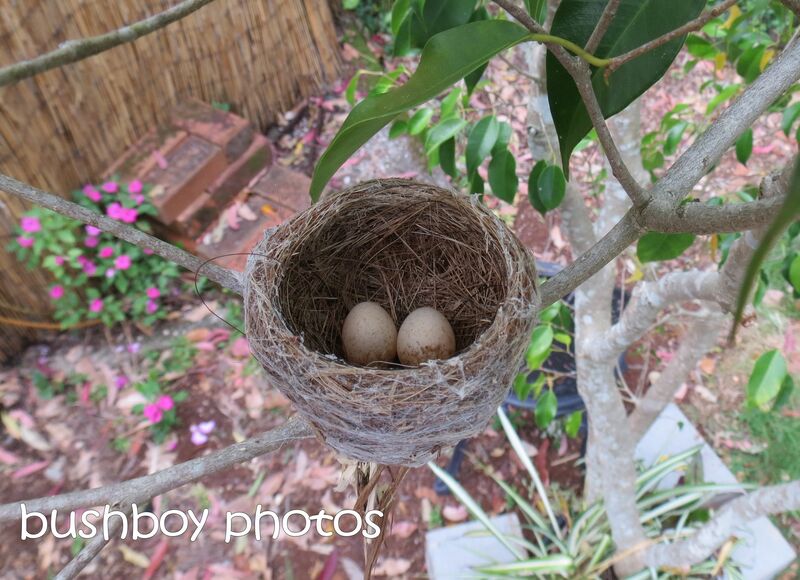 This female Figbird found the seeds of an Umbrella Tree. The male Figbird was more interested in pecans. The Green Catbird is also interested in pecans. Not long after this photo was taken, so was the pecan. Another recipient of the fallen pecans is the large Brush Turkey. His strong beak breaks open the pecans and often leaves small pieces behind for the other birds to eat. This one we call Brendan who has taken over the garden and has a mound nest almost one meter tall in the front garden. One day I’ll try to get a photo of Brendan and his mound. The most exciting discovery was finding a Regent Bowerbird just on the edge of the garden late one afternoon. I only managed to get a couple of bad photos but had to share in my excitement. We went to Byron Bay one day to shop as we haven’t been for ages and Winter is a good time as the number of tourists is halved at least. The Golden Pendas are in flower and the Rainbow Lorikeets were having a great time screeching at each other. And of course there are always chooks foraging around both our gardens. That is a snapshot of some of the birds around here in June. 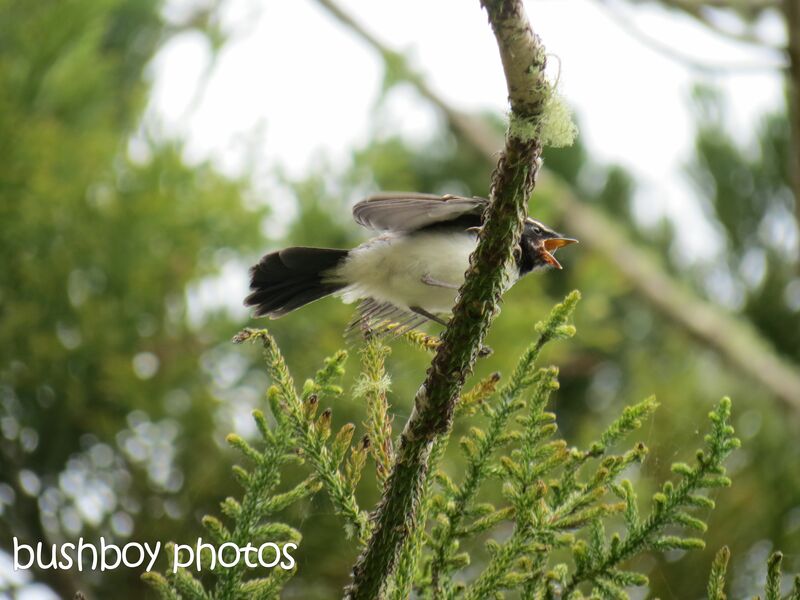 My June photo round-up probably won’t have any birds this year. Hopefully I’ll get to that by next week. 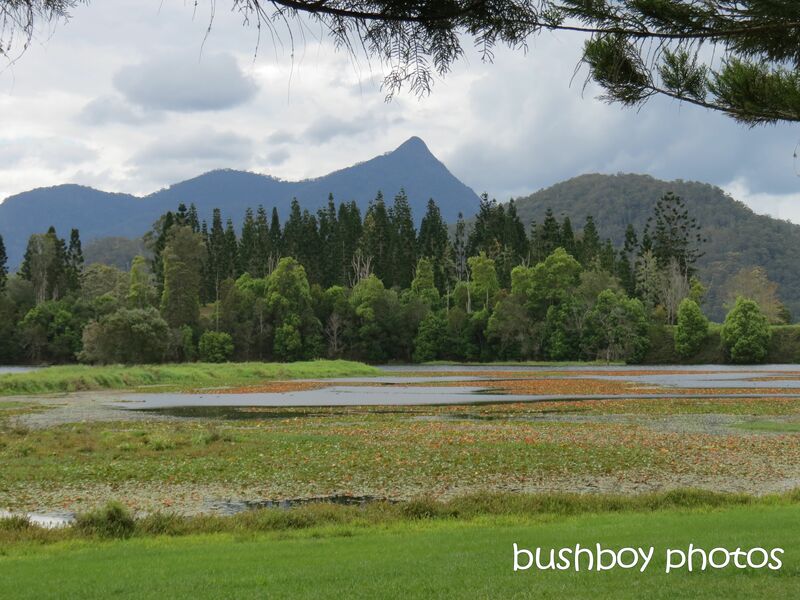 March was a month of contrasts, a couple of hot days followed by a bit of rain and then Cyclone Debbie came along. I was fortunate not to be in the path of Debbie but on the edge of the system. I missed the strong winds and abundant rainfall. I still managed to have 476mls of rain for March. This rainfall ended the long dry period over Summer when usually the rains come. The total rainfall for March exceeded the total rainfall for the 6 months prior. The few dry day did allow for some wandering about and finding some interesting stuff. The weather also bought out a good variety of fungi which have their own blog. So onward to the stuff of March. Isn’t this little boat the cutest? The flood waters made the creeks run and the creek at Emerald Beach broke through the sand and flowed to the sea. The strong tannin coloured water gave the rocks an interesting hue. Rust. As you know I love rust, the colours and textures rust gives to metal. More rust on the fence around the riverbank park in Grafton. In Lismore, wandering the back lanes I came across this furnace door that is still in operation at the rear of a cafe. One of the treasures of Lismore is the street art in the back lanes. The recent flooding of Lismore didn’t damage most of the art works although some may need a bit of a clean and touch up. The following selection is from just one lane way. The art on the door is perhaps a portend. The fish managed to swim out the flood waters I am told. I love this ghostly face. The butterflies in the rainforest. Speaking of butterflies, I just love photographing butterflies. Of course many a while is spent chasing them around trying to get THAT capture. The Common Yellow butterfly seemed to enjoy time on the ground. The Small Green-banded Blue butterfly kept trying to hide from me. I haven’t had such a variety of flies at my place or perhaps I haven’t really taken a close look at them. The yellow face and bottle green body look great. The green eyes are striking. The long proboscis also lets this fly give you a very sharp sting. This beautiful Huntsman spider lived in my house for around two months. She has now gone outside I think as I haven’t seen her for a couple of days. Her leg span from front to back or side to side is 16cm. Her body length is 5cm. How big is your hand? The Fire-wheel trees are flowering. I have a number of Golden Lycras that my aged neighbour loved. He gave me lots of corms and this year they flowered the best ever. They gave me lovely memories of him. The view from the top. They looked so lovely in the morning sun. This Hibiscus was in my parents place and the cutting has lived on at my place filled with abundant flowers this Autumn. One of the original Hibiscus. This one is in my besties garden. Such a delicate flower. The petals almost look transparent. Another tiny native flower that I have found around my property. 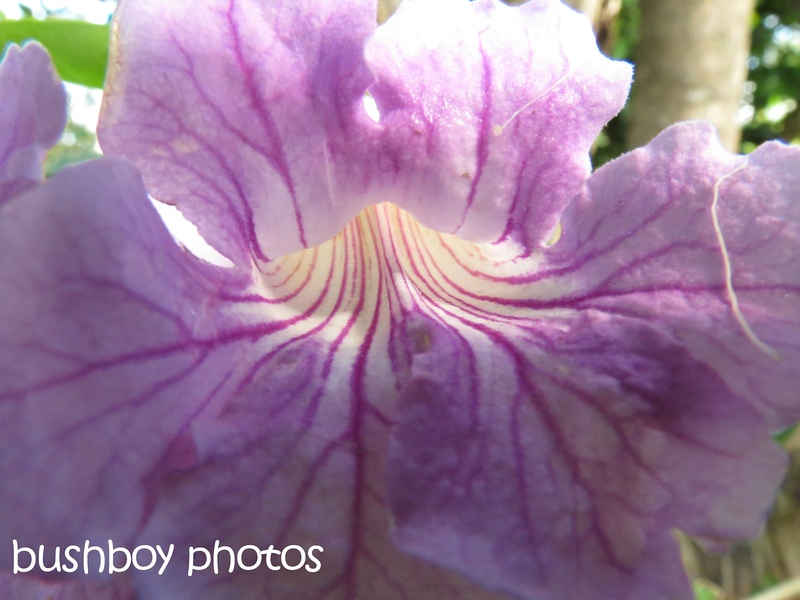 The flower is about 12mm across so imagine the size of the insect that was getting some nectar or pollen. The Bromiliads had a good flowering this March. They gathered enough water that’s for sure. I hadn’t seen white Crocus before. Stunning flowers aren’t they? I have loved the colours of Coleus since I first saw them in my grandfathers garden. The rain has revived the Lichen. Wandering around the garden looking for snacks, the Bar-shouldered Dove and Emerald Dove shared the space. A little Jacky Winter enjoying the morning sun. 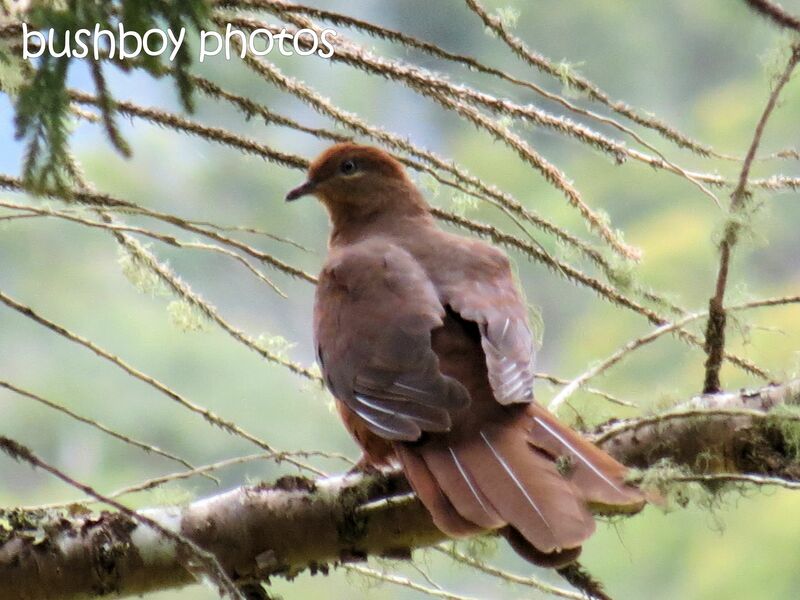 The Brown Pigeon sat in the Poinsettia striking a lovely pose. 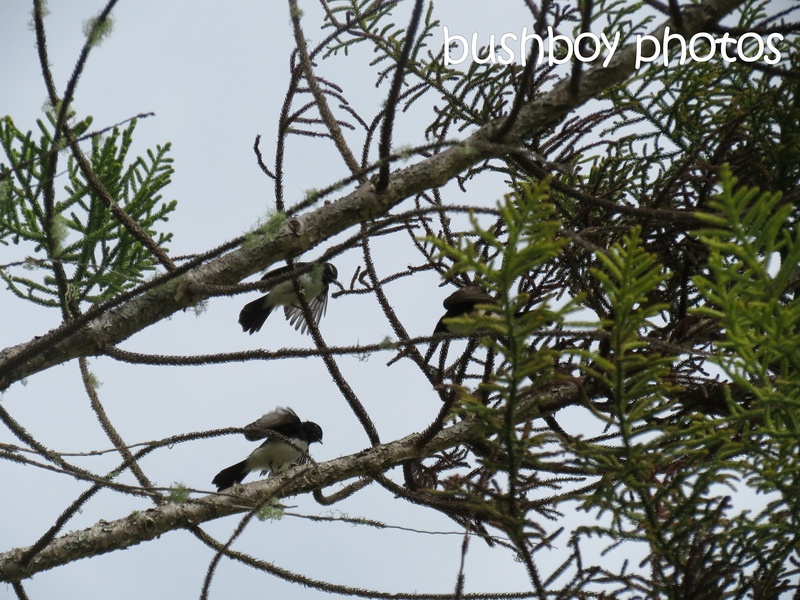 Not the best angle for a Blue-faced Honeyeater though. The little Forest Kingfisher sat in the tree looking about then suddenly plunged to the ground. When he resumed his perch, he did the bash bash on the branch to tenderise his snack. It looks like he managed to find a frog in the garden. The Forest Kingfisher has beautiful colours don’t you think? Thanks for taking the time to have a look at my March. A new sign for the property so any of my Airbnb guests can find me a bit easier. Thank you to my bestie, not only a fabulous artist but a great signwriter as well. Over the next few weeks the old orange “post” will have a bit of a make over as well. Some of the photos are repeats of subjects that have been in and around my place for the past few months. There is always room for a butterfly or two, a dragonfly and some birds who have been showing off this month. So off we go – have you got your cuppa and are ready to see what I have found in November…. The Square-tailed Kites are still on the nest and I am anxious to see some small heads appear above the nest. Maybe the next blog will have some little Kites for you. It was a warm day so she was sitting on the edge of the nest with her wings out to help cool her down. And then see spotted me. The Caper White Butterflies have started to lessen in numbers but there was a flurry of butterflies earlier in the month. I am fascinated that some butterflies like sitting on the ground. Australian Painted Ladies seem to enjoy life at ground level even if the ground is bone dry. I was waiting for ages to get a photo of an Australian Painted Lady with its wings open as I saw the flash of green as it was flying about. An amazing green colour isn’t it? I always have the little Lineblues flitting around the garden. I noticed that this one seemed different to the others. When I looked in my butterfly book, I found it was still a Lineblue but couldn’t really discover which one it is. Funnily, when I put Lineblue into a search engine for images, there were some of my own photos which didn’t help much at all. The Orange Grass Dart almost matched the colours of the Dietis Bicolor. The doors are closed but the Robber Fly seemed determined to get inside out of the heat. It was sitting on the door jamb waiting for me to go inside. Of course there are dragonflies about the garden especially after I have watered the plants. Their wings are wonderful to look at and the more you look, the more you see the lines and shapes. With this Dietis iridioides, the little Native Stingless Bees have to venture down inside the flower to fill up their pollen sacks. As I sit at my desk this Copper-headed Skink is always busy doing his Skink business around the verandah. He moves so fast when he wants that it is so hard to get a photo. One day I’ll be able to show you his face….one day. All the birds sit on the edge of the bird bath but the White-throated Treecreeper has its own unique way. Bird number 92 in my list of birds who I have identified (with help of others when I cannot find them) was the Brown Pigeon. Not the Brown Pigeons best side but these colours and markings that you don’t always see. I was wondering why the leaves and flowers of this plant were on the verandah and the plant looked a bit scrappy. One morning while I was at my desk, along came a Friarbird who started plucking leaves and flowers. The Satin Bowerbirds were also having a go a while ago too. The Yellow-faced Honeyeater was enjoying the morning sun. Another photo from my desk. This year has been dry but the conditions have suited the Crinums. They have had 2 or 3 flower spikes so far this Spring. Such an amazing flower. 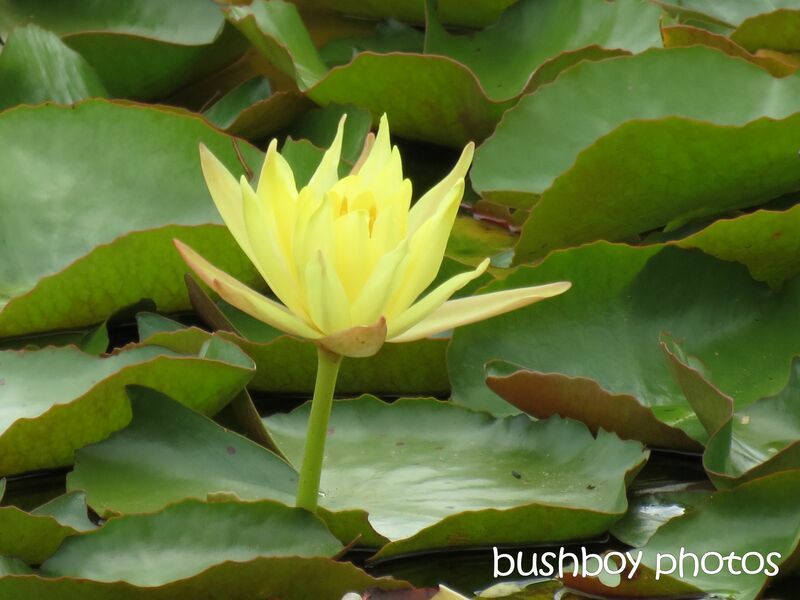 The Lilli Pilli has also had a good flowering. The small tree was just bursting with red flowers which the Native Stingless Bees have been enjoying too. Check out the pollen sack on this bloke and wonder how it can still fly let alone gather more. The Scarlet Honeyeaters also look good from the back don’t you think? They are lucky to be able to have almost exclusive rights to the Lilli Pilli flowers as the other honeyeaters are too big to land and eat. It certainly takes a bit of acrobatics to utilise the flowers nectar. It’s almost time to turn on the lights, think about dinner and wash up my cup. Have you finished you cuppa too? November had the Super Moon. Well it wasn’t very super at my place but still is a lovely sight in our night sky. Good night…..see you next time. I love it when I have a mixed lot of photos I have taken. This blog does contain a lot of birds and things that have been previously in past blogs but they keep doing things that are different or I just like the photo and hope you do too. There is one photo that has something different from the usual photos, can you spot it? The weather over winter and early spring has been dry with some hot days and some windy days. Since 1 August to end of October there only a couple of days where there was good rainfall, but only 14 days of rain over 3 months. Some of the flowering plants have enjoyed the dry. This year the bottlebrushes and paperbarks have had the best flowering ever. One of the things I like to photograph is when I can see faces in things. These are a couple I have seen lately. Can you see the faces too? The first on was taken at the beach during a walk after a North Coast Landcare get together. Can you see a dog? Sometimes the faces can seem rather scary. I had a feeling that someone was watching me. The Red-necked Wallabies have had a bumper Joey season this year, so it may indicate that the grass in the paddocks will soon turn green and there will be a good summer. These two were eating beside the veranda where there are patches of feed. 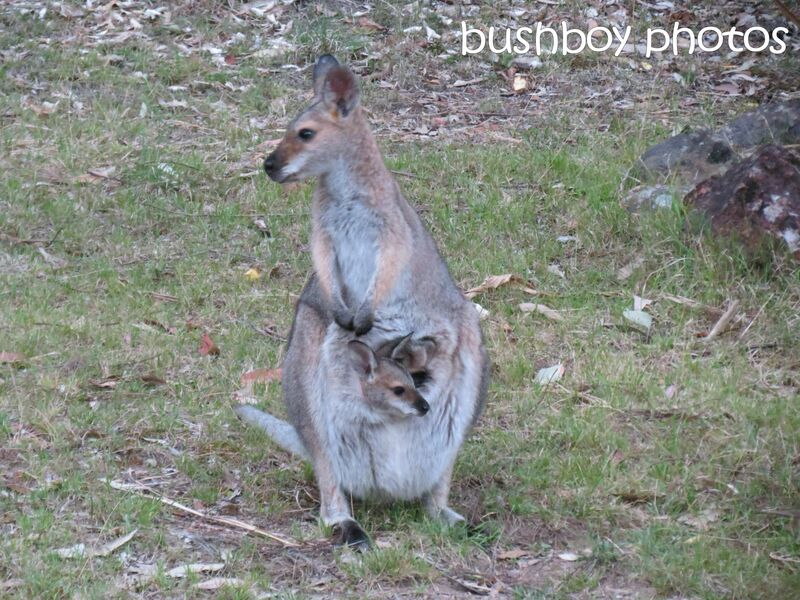 The Joey may be too big for the pouch but still likes to get a drink from Mum. One plant that has had a fabulous flowering this year has been the Native Frangipanni. The birds and insects are always around the tree in the early morning and late evening. My besties garden always has flowers as the rainfall there is much better than at my place. I love the way that this flower seems to explode towards you. The colours of this small flower are stunning adding a splash of colour throughout the garden. My hanging pot of bromeliads have never had so many of these striking red flowers. I counted six flowers around the hanging pot. Yes that is a bird’s nest I found on the ground and was placed in the pot. I wanted a few flowers around and planted some Alyssum seeds and they all came up giving cascades of white flowers from the many pots they were planted in. There were bees and this Hover Fly (I think) buzzing around. What a golden coloured fly!!! Other visitors to the Alyssum flowers were small butterflies. I managed to get a photo of the Ochre Butterfly before is zoomed off to another flower in the garden. You can see how dry the ground was when I took a photo of a Meadow Argus. They prefer to land on the ground. The underside of their wings seem fluffy and dull…..
….but the inside wings are very colourful. In late October the Caper White Butterflies started to fly through my place on their migration to SE Queensland. They have been constantly been in the garden since then. The Pentas is a great butterfly attracting bush. While walking around Grafton we spied some bee activity around a large Camphor Laurel. I am glad they were too busy to notice me trying to get some photos. When we went back a couple of weeks later there weren’t many bees around at all. Sadly I suspect the Council may have sprayed the nest. The coming of warm days brings out the insects. There are a good number of varieties of flys at the moment. This brown fly spent some time walking around the rim of the jug on the window sill. While this insect preferred the window to walk about. 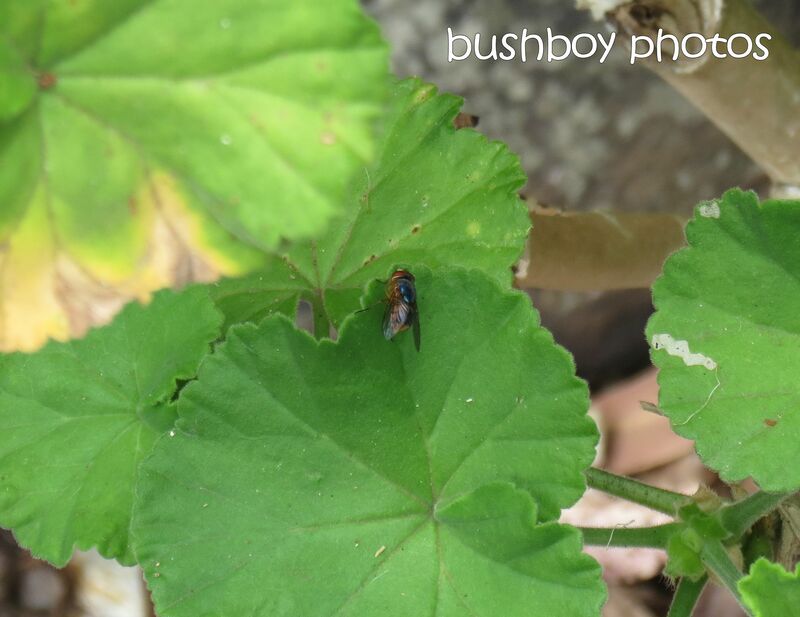 The garden also has its share of insects and bugs. I love the colours on this beetle, don’t you?. The Dragonflies are swooping around the garden and the dams. This is the blue variety. I think will do a blog just on Dragonflies as I have some other varieties. On the walk along the beach I spotted some birds sitting on some rock off the shore. 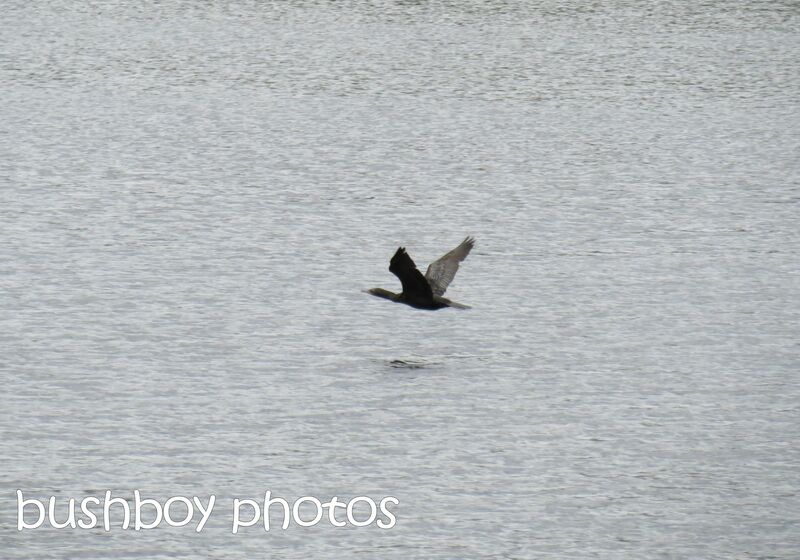 The Pied Cormorants were doing their washing. Here is bird number 91 I have identified on my place. (I say “I” but has been a team effort from lots of people in my network.) 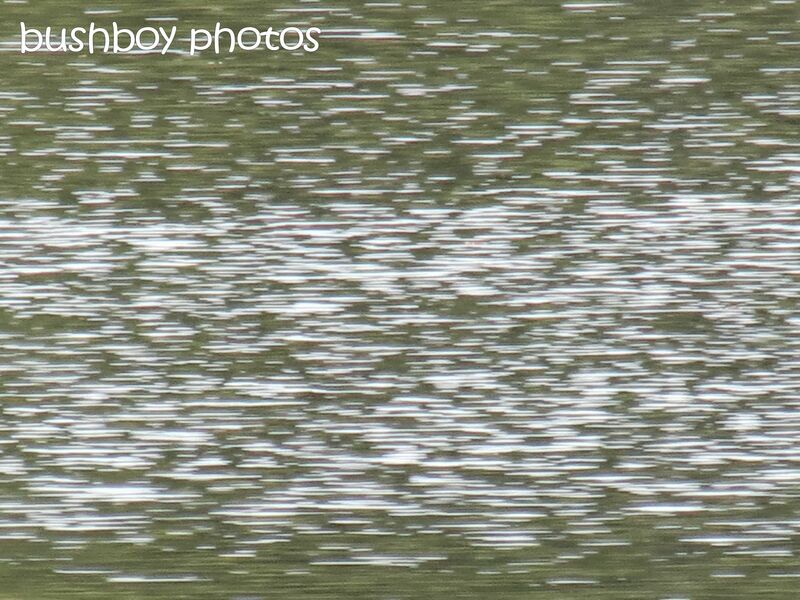 The Common Bronzewing was just strolling along but I managed to get a not very good photo. Back at the beach walk, on the way down to the beach through the dune I saw a New Holland Honeyeater gathering material for the nest.I’m sure the spider didn’t mind a bit of web taken. Isn’t it funny how birds can have their heads looking back. The Brown Pigeon was certainly keeping an eye on me. 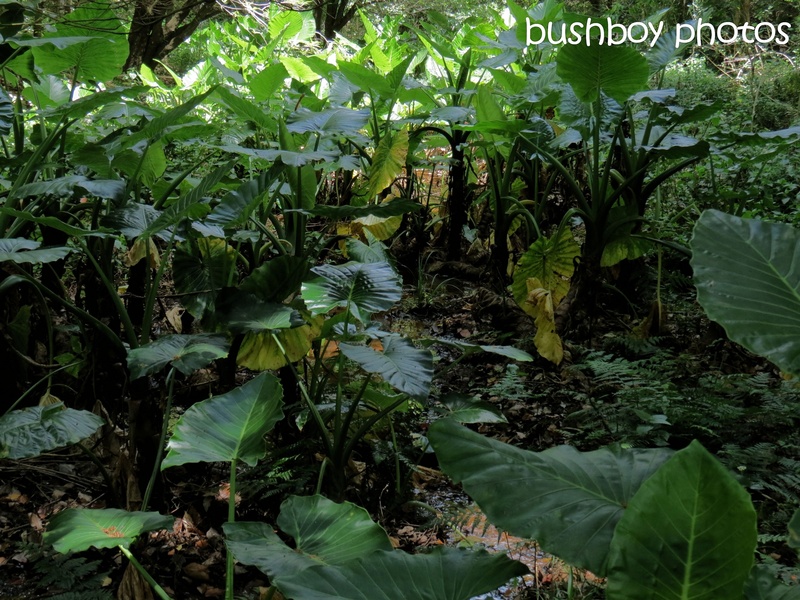 Amongst the vegetation, chit chatting away the Eastern Whipbird foraged for insects. Their distinctive whip crack call (from You Tube by Linda Hansbauer) many people know but when they are on the ground bustling about the have an insane cackle going on. The most elusive bird at my besties is the Green Catbird and I am always excited when I find a Catbird amongst the foliage. In Spring, the Figbirds arrive at my place. Late one afternoon I found this pair cosying up for the night among the branches of the fig tree. Of course you have seen lots of Blue-faced Honeyeaters on the Honey Gem Grevillea in my previous blogs but the way they can have a snack upside down always fascinates me. The Yellow-faced Honeyeater is contemplating the first flower on a Grevillea I planted a few years ago. I will have to try to find out the name of this Grevillea. The Tawny Frogmouth (or it may be a Marbled Frogmouth) has the most basic of nests. Just a few twigs thrown onto a flattish spot in a tree. This bird hatched two babies. Late in the evening, a walk along the shore at Ballina saw many pelicans coming in to roost. First stopping on the light post to make sure the fishermen weren’t cleaning their catch. It’s almost time to go…. …..the moon is up casting a glow so I must be off. See you next time. Oh yeah, it is Spring. So much is happening, the weather is great for wandering around the north coast and there are so many things to see and do. One drive about took us to Clarrie Hall Dam at the Crams Farm end of the storage. Tweed Council have done a great job making it a great place to visit. Just the view as you drive in is spectacular. The water is covered in water lilies and water birds are everywhere. 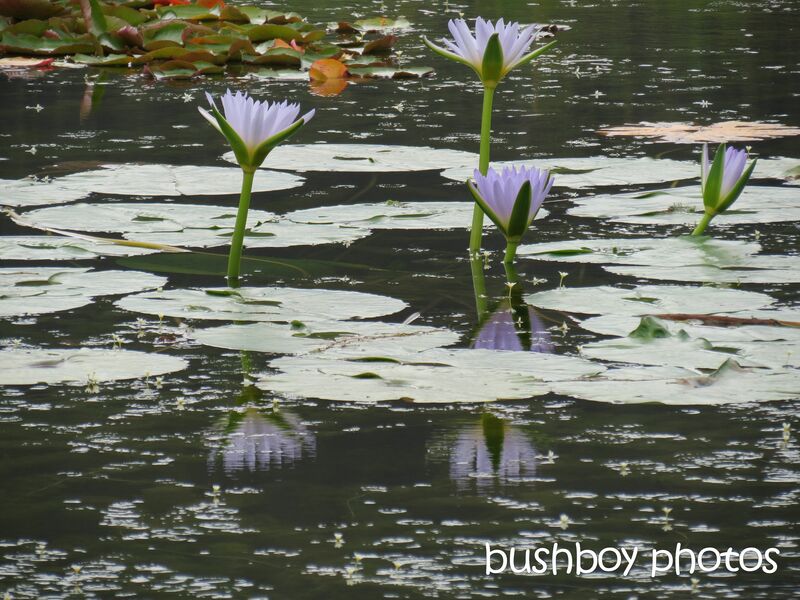 The Cape Waterlilies make a stunning sight as they stand tall. 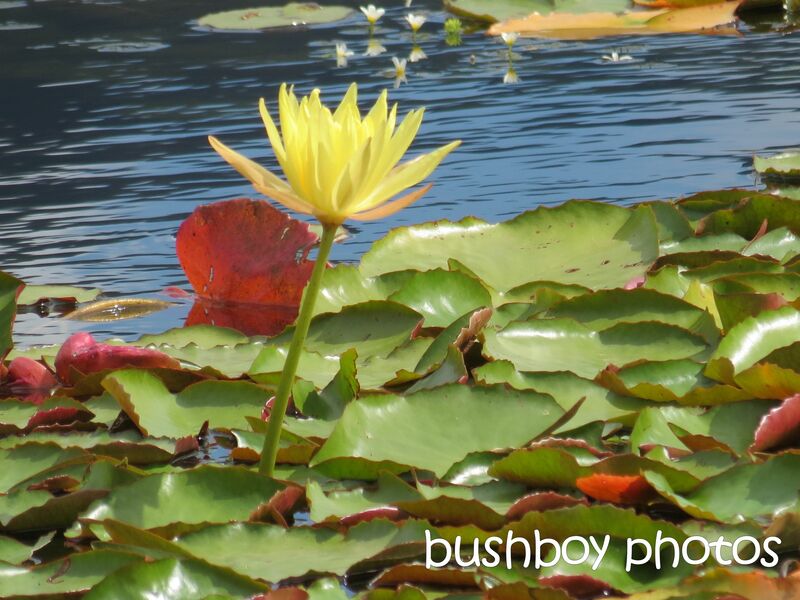 The Yellow Waterlilies are dotted here and there around the dam. It is so crowded that the leaves curl making it hard for the lilies to push their way skyward. Unfortunately, under the water’s surface is a good amount of Cabomba, an introduced plant from America, usually a fish tank escapee. At the moment it is flowering which makes a good resting spot for dragonflies. 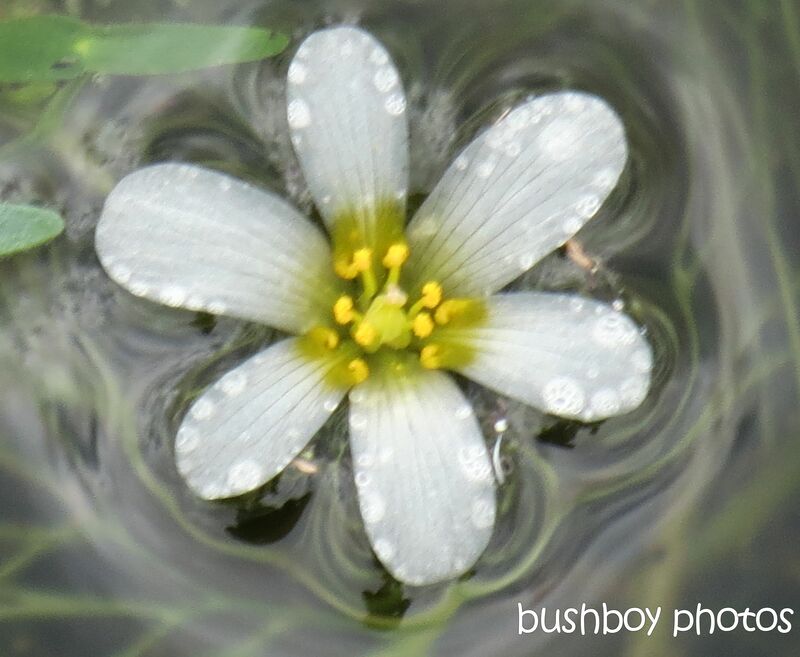 This flower was partly submerged and made great patterns on the water. In the trees, as well on the water, were many birds enjoying the late afternoon spring weather. The Brown pigeons were always wary of the bloke with the camera. 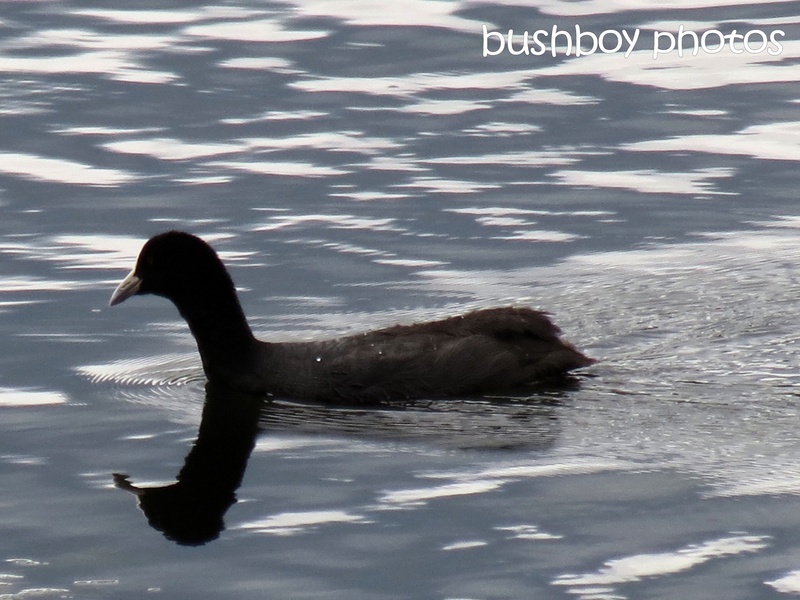 While the Eurasian Coots just paddled around looking for something to eat before it was dark. 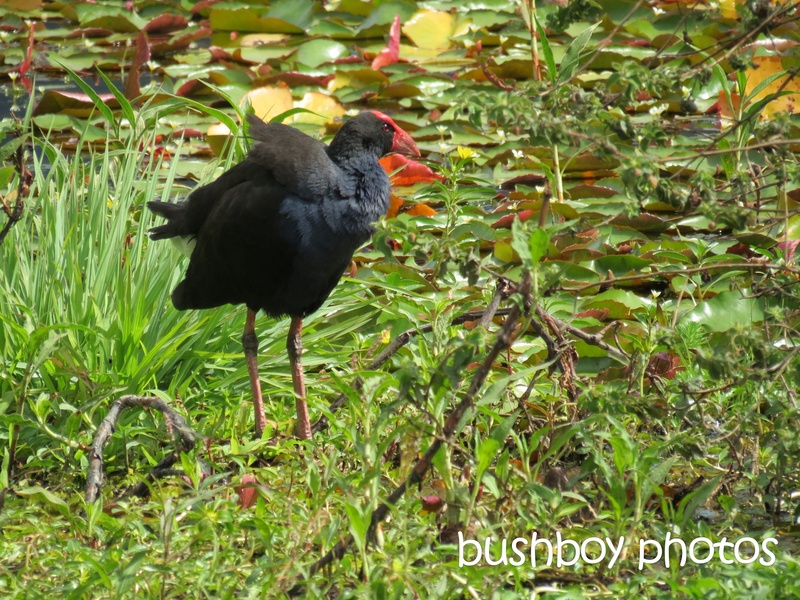 The Purple Swamp Hens were always walking about, flicking their tails and squarking in general. High in one tree the young Willie Wagtails were practising being big birds, flapping wings and generally making a racket. The adults were telling them to be quiet, I think. Just sitting and looking at the water was very relaxing but it was time to head home. 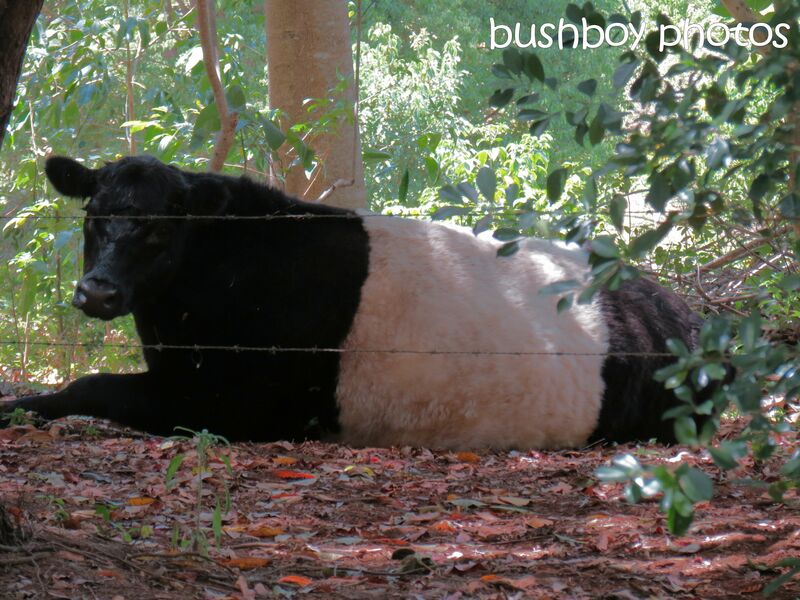 When we got home, there was Badger, who had found a shady spot to lay down on the warm spring day. Going down to the creek there were birds staying cool among the trees and shrubs. 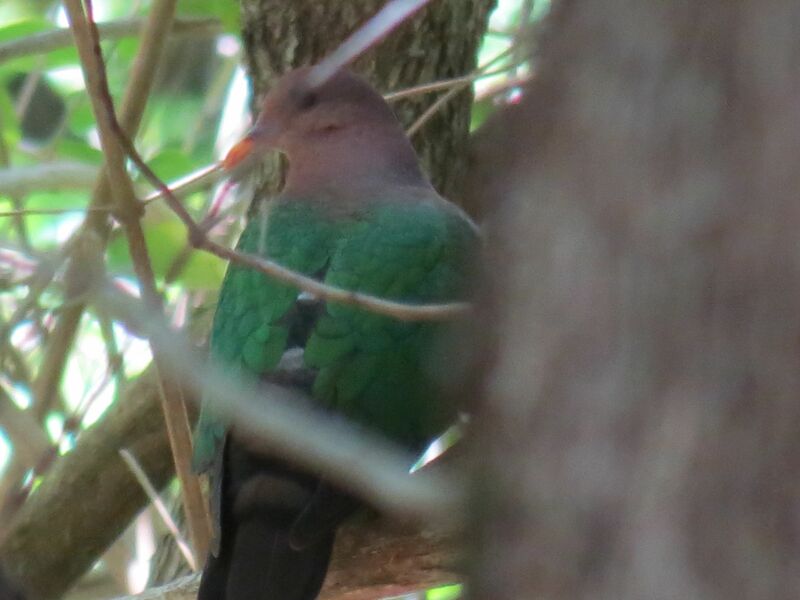 The Emerald Dove kept moving around the tree, all the while watching where I was going. 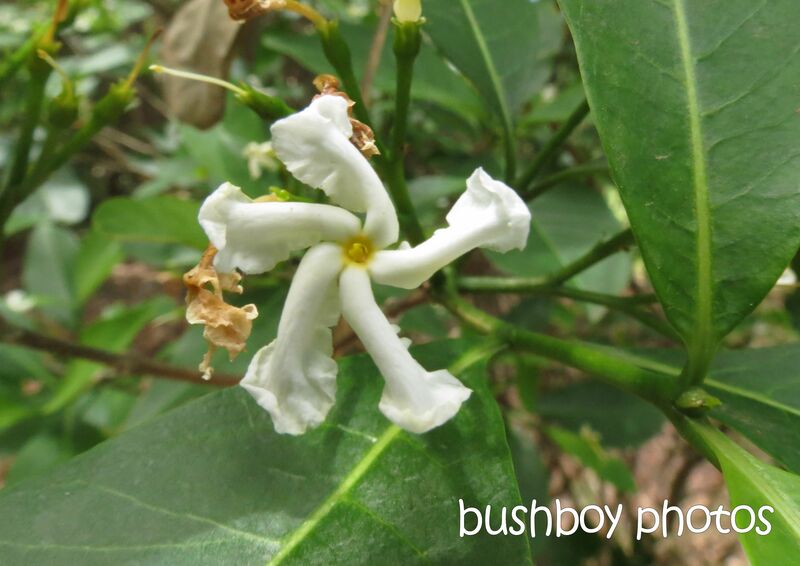 Scattered through the bush are little native gardenia plants with their amazing looking flowers. I just had to see what was inside the purple flower growing on the fence around the house. It wouldn’t be Spring if there weren’t birds nesting. 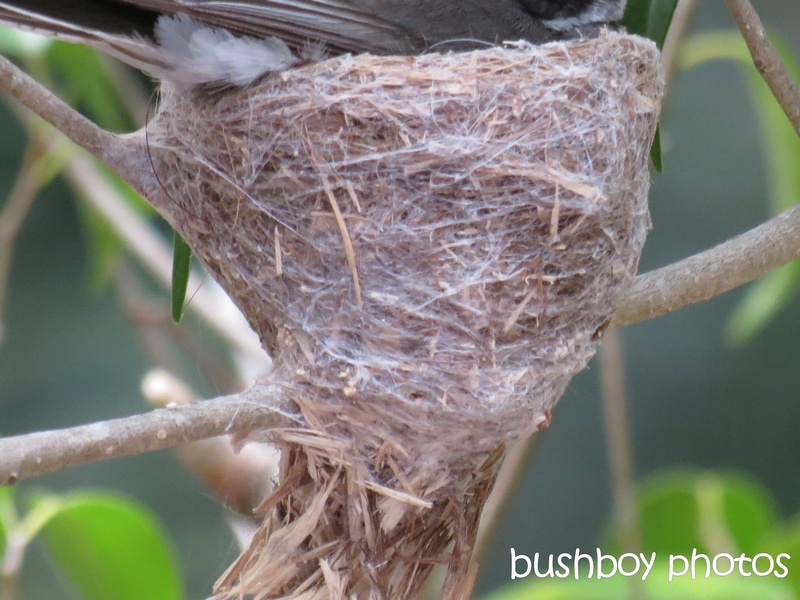 The Fantails nest is held together with spider web. She sat there watching me as I watched her. I was waiting for the change over of the egg sitters so I could see how many eggs were in the nest. Two small lovely eggs. 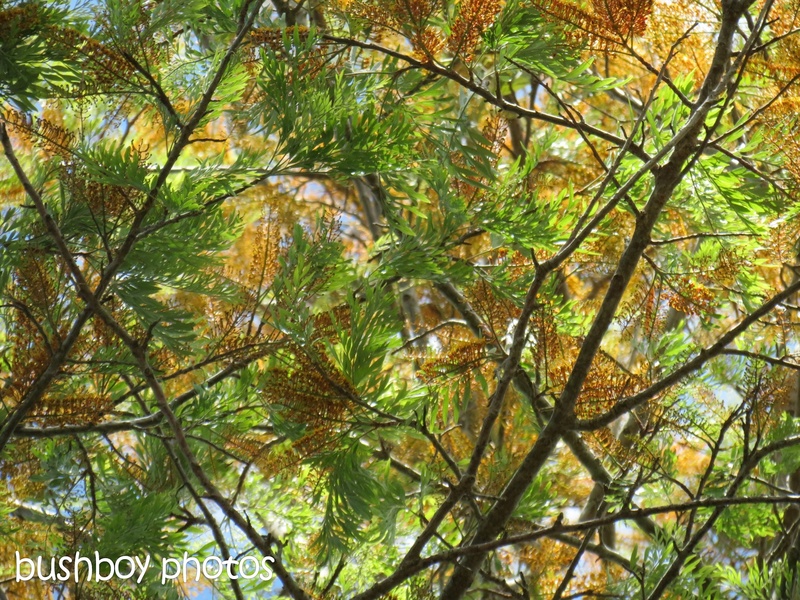 Looking up, the splashes of green and orange of the Silky Oak made wonderful abstract patterns. The warmer weather also had a few blow flies whizzing about. This one seemed to like the pelargonium leaves more than me. 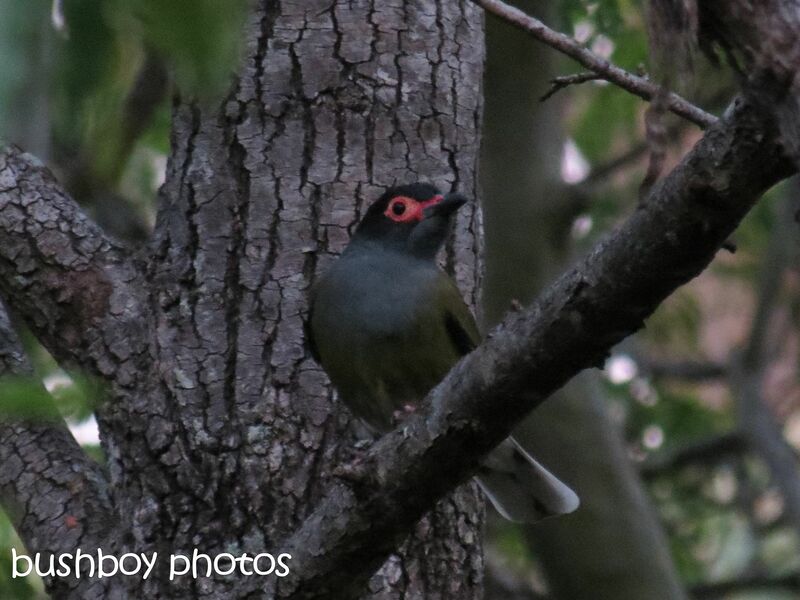 Late in the afternoon, near dark, the Figbirds were singing their wonderful song. In the front yard, the wallaby wondered if the joey was at home. A bit of a long one but thanks for getting to the end. I have so much more, so I better get started on the next installment of my Spring.